There will be an artist reception and artist talk for Erik Sandgren, for his exhibit, "Parallels: Making the Avenue of Elms." 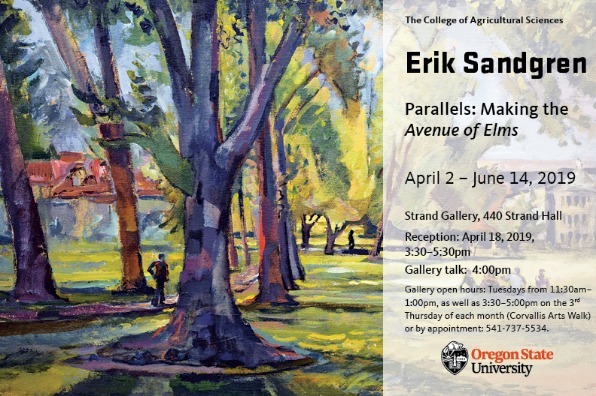 Erik Sandgren will discuss his gallery show which depicts the "parallel painting" process he used to create a commissioned piece in 2015 for the Oregon State University Foundation. The piece commemorated a decade of monumental fundraising and construction efforts lead by OSU president Edward J. Ray. The exhibit, open April 2 through June 14 in the Strand Gallery, features 24 paintings and 38 digital format sketches. The exhibit documents Sandgren’s pursuit of an origin story: lyrical, powerful, culture-defining moments evoked in remembrance and respect.